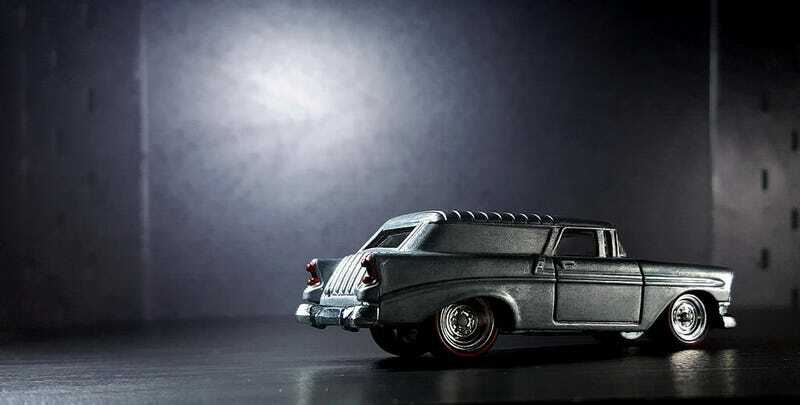 Had this Chevy Nomad cast for a while now. 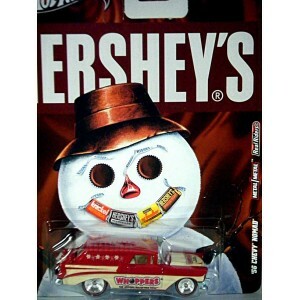 The paint scheme, done by HW as one of the Hershey series of cars, was actually not that bad. It was bright, in gloss red and tan, and was overall nice to look at. But then I got to watch a lot of TV shows, about how Nomads are being restored, or ‘hot-rodded.’ So I got into thinking, a Nomad’s basic shape is not that bad, why dont I make a hot rod of my own? What I was hoping to be a quick and simple tampo removal job... didn’t exactly turn out that way. The names just wouldn’t come off, its like the tampos were ‘hard baked’ into the paint? Or maybe a clear coat was applied over it? Whatever it was... it wasn’t coming off as easily as I thought. After about an hour of trying, I just gave up on the tampos, and decided to remove the whole lot. After disassembly... I dipped the body in paint remover gel and took everything off (tampos and paint). Thinking that I can always repaint it later.... I just left it in bare metal for a few min. As it turned out, after looking at it for a while, it looked gorgeous. Kinda has a ‘mad max’ beauty to it. So I think I’ll just leave it naked for now.